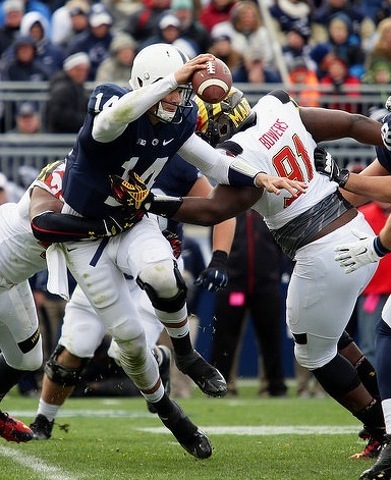 Christian Hackenberg (14) against Maryland in 2014 in Beaver Stadium. Photo by Paul Burdick, StateCollege.com. Maryland has an interim head coach. Rutgers had an interim head coach – for game days, at least -- for three weeks. After meeting the Illini next Saturday, the Nittany Lions will have faced three interim head coaches – Maryland’s Mike Locksley on Saturday, Rutgers’ Norries Wilson last month and Illinois’ Bill Cubit – in the course of seven weeks. And that’s just the head coaches. 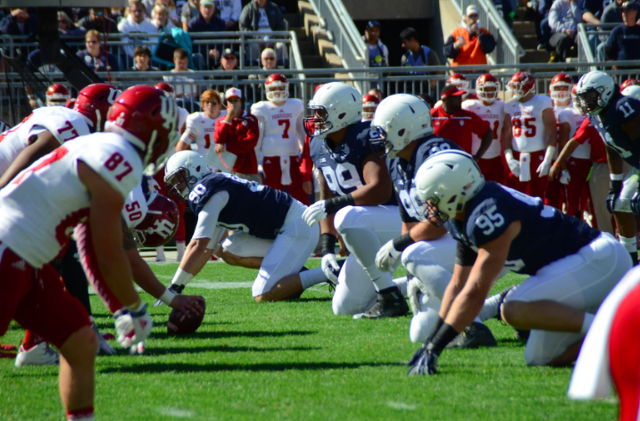 In Beaver Stadium two weeks ago, Indiana had an interim quarterback (and then an interim interim quarterback) and an interim running back, who were nowhere close to matching the 414.4 yards of total offense the regular guys produced. Michigan’s head coach isn’t interim, but in retrospect (chronicled in fascinating detail in John Bacon’s excellent book, “EndZone: The Rise, Fall and Return of Michigan Football”) the guy before him was. Brady Hoke was just keeping the seat warm for four years until Michigan and Jim Harbaugh patched up some hurt feelings. Interim hurt feelings, as it turned out. Northwestern is never interim. Pat Fitzgerald’s staff has been with him for five years – and counting. Almost ditto for Mark Dantonio at Michigan State, where seven of his assistants have been with him at one time or another for seven seasons. And same goes for Jerry Kill at Minnesota, who’s had the same staff through several stops over two decades. Although that’s not the case with his athletic director, Beth Goetz, who took over for Norwood Teague when he resigned in August in a sexual harassment scandal. We don’t know how long first-year head coach Mike Riley will stay at Nebraska. We do know the Cornhuskers are 3-4. And we certainly know that any lead by Nebraska in 2015 has a pretty darn good chance of being interim. All four of its losses have come in the final minute of the game – there was a Hail Mary loss to BYU in the opener (33-28); a fourth-quarter rally against Miami (Fla.) thwarted by an interception in overtime (36-33); a decision to pass late in the game rather than run against Illinois (14-13); and a final-second field goal by Wisconsin (23-21). Speaking of which: At Wisconsin, Paul Chryst returned in the offseason to become the head coach in Madison, where he was offensive coordinator from 2005-2011. Chryst was head coach at Pitt for three years (2012-14), a stint that really proved to be interim. Of course, with eight or so head coaches – one of whom never even lasted long enough to actually coach – since 2010, the Pitt job would seem to be permanently interim. Not that Penn State hasn’t been Interim State, either. Following the firing of Joe Paterno, Tom Bradley was head coach for 46 days, Bill O’Brien was head coach for 724 days, Larry Johnson was head coach for 10 days and now Franklin has been head coach for 650 days. Penn State’s program is certainly in transition, which in some instances is a nice way of saying interim. Penn State’s punter on Saturday won’t be its punter in 2016. Neither will be its quarterback. Some people don’t want its offensive coordinator to be, either. It’s been an interim offensive line of sorts, too. Derek Dowrey and Brian Gaia were defensive lineman in 2013. Paris Palmer played junior college football, so he’s interim, too. (But it’s been my personal experience that’s he always a nice guy.) The Big Toe may be the interim field goal kicker, but I hope not. Despite all the discussions, I doubt Beaver Stadium will be an interim homefield for the next few years. It’s a $1 billion bet and I bet they’re looking at renovating rather than replacing. Speaking of keeping with tradition: Pitt is coming back on Penn State’s schedule in 2016, for the first time since 2000. But that’s only for four games, through and including 2019. So that’s interim, too. The way the Nittany Lions’ schedule has gone, with five consecutive games at Beaver Stadium, the back-to-back away trips to Columbus and Baltimore have a very interim feel to them. That’s especially true since Penn State didn’t leave the Commonwealth for the first six games of the season, given that opener at The Linc in Philadelphia was just 196.3 miles from Beaver Stadium. And closer to campus for tens of thousands of PSU students and alumni. For Franklin, the game in Baltimore will have some vestiges of a homefield-like feeling to it. He coached at Maryland for eight seasons over two stints and although the Terrapins played primarily in College Park, Franklin knows Baltimore well. As he does the Terps. In addition to serving as offensive coordinator and quarterbacks coach from 2008-10, for part of that time Franklin was also the head-coach-in-waiting behind Ralph Friedgen. But that was just on an interim basis. Three-star defensive tackle Christian Colon announced Thursday that he has opened up his recruitment process again, and is now no longer verbally committed to Penn State.